Plans indicate the narrow section of reserve north of the Eric Street bridge could bear the brunt of the tree felling to get the PSP through Cottesloe and on to Fremantle. GREEN-LEANING councillors face having to agree to cut down about 50 trees to get a long-delayed commuter bike path through Cottesloe that will eventual connect to Fremantle. 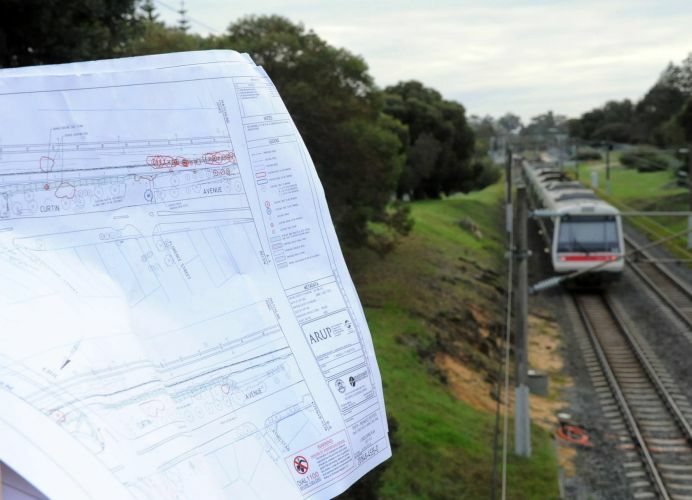 “I saw the plan this morning, and it was a pretty lazy piece of town planning as it’s just a straight line that doesn’t seem to take into account the trees in the way,” West Tree Canopy member Peter Dickson told communitynews.com.au. The $18.7m Cottesloe-Mosman Park Principal Shared Path (PSP) is planned to be complete in 2018-19, before a section to Tydeman Road, North Fremantle the following year and a connection to Fremantle 12 months later. Plans at a Cottesloe Council committee meeting showed the route between the Grant and Victoria streets’ running 3.5km mostly near the Fremantle railway line, with about half the trees, bushes and bush planned for the chop north of the Eric Street Bridge, where the PSP is close to the railway and where there is limited space to get under the bridge. Removing the trees with trunks up to 1m, bushes and some bush in Cottesloe has sparked concerns including loss of shade for cyclists and a reduced green canopy . “I’m absolutely in favour of planning and building bicycling infrastructure for its health, environmental and economic benefits, but we should not be asked to do that by compromising the benefits of a tree canopy,” Doctors for the Environment’s George Crisp said. A Main Roads spokesman said the PSP was in the rail reserve as much as possible to ensure minimal vegetation was disturbed, no Norfolk Pines were affected and the PSP design could be altered further to reduce the impact on existing trees, split about evenly between Crown and council land. The spokeswoman said landscaping and revegetation, using Cottesloe Council advice, would be done after the PSP is completed, and access for felling was being discussed with the PSP-supporting council, which will consider the proposal this Tuesday.